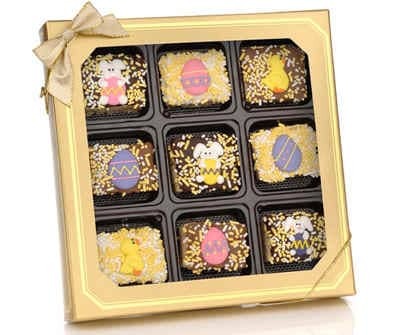 These delicious Crispy Rice Bites are hand dipped in your choice of Chocolate - Dark, Milk or White - decorated with adorable hand crafted Royal Icing Decorations* and accompanied by yummy candy sprinkles in a very fun Easter theme. Our Crispy Rice Bites are hand packed in our Candy Trays and presented in our lovely Window Gift Box and finished with a Bow. Our Crispy Rice Bites are made fresh to order. We use extra marshmallow to make these treats extra yummy. Order them for someone you're sweet on or for yourself! We guarantee these sticky sweets won't "stick" around very long! *Royal Icing Decorations may vary.